Mannix von der Weyermühle was a working police dog in the Düsseldorf area of Germany and died in 1996 from injuries sustained protecting his Police Handler in a riot at an immigration relocation centre. Mannix took some blows from an immigrant swinging a lead pipe and at the end of the night his handler noticed Mannix was holding his head a little strangely. Upon close examination it was discovered that the blows with the lead pipe had broken his neck and crushing several vertebrae which eventually caused Mannix to lose sensation in his rear. Alfred: SchH 3, FH, IDC-Weltmeister and passed the Körung 'for life' with highest rating for working drives and middle sharpness. 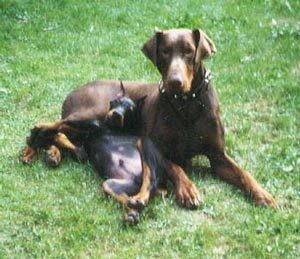 He is sire of the von der Burgstätte “A” litter (Asco, Addy, Arno) and Germania “A” litter (Arrex, Anja, Anushka). Apollo: SchH 1 and passed the Körung with Körklasse 2B rating. He is sire of the von der Drachenburg “A” litter (Aissil, Amica); vom Eschenbruch “F, G” litters and vom Burghof “C” litter (Comet).